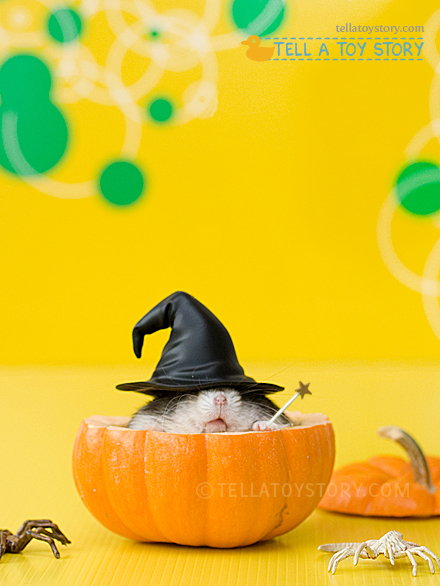 Behind the Scenes: This was Mario’s Halloween photoshoot last year (2009). The hat and wand were Pinky Street accessories worn by Yuki Nagato from the Haruhi Suzumiya series. They were just the right size for Mario. The wizard hat was lowered onto Mario’s head via a thin wire and then digitally removed in photoshop. The wand was digitally added afterwards to make it seem like Mario was holding it. As for the creepy crawlers intruders, they are face huggers from his Neca and Mcfarlane collection. The mini pumpkin was purchased at a supermarket and hollowed out which transformed it into a magical pumpkin for Mario the Great. Next post: Happy Halloween? You Bat-Cha!